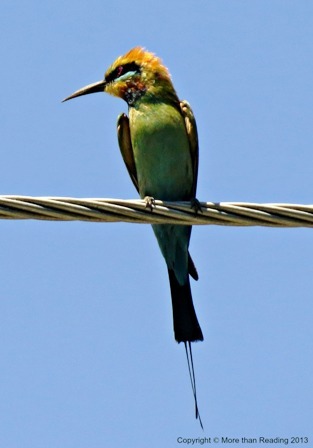 A bird on a wire: a colourful bird, on an ordinary electrical wire, on an ordinary suburban street – unlike Leonard Cohen’s ‘Bird on the wire” song of 1968. But what bird is it? Internet searches come up with ‘No result found’. I can’t insert information like ‘bird type’ or ‘common name ’ because I don’t know them. 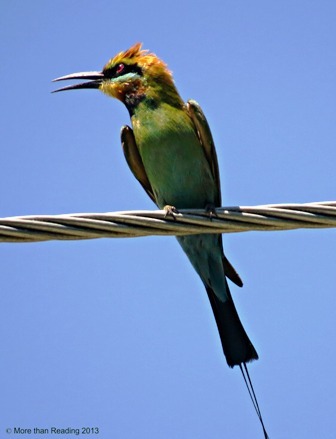 After viewing dozens of bird pictures, I cannot find this bird. 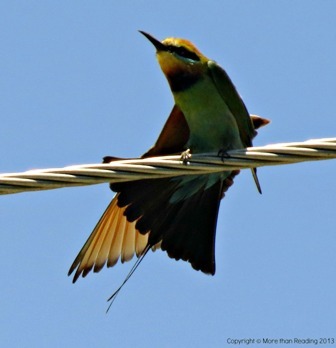 Fortunately, it stays on the wire for several minutes enabling me to keep clicking. 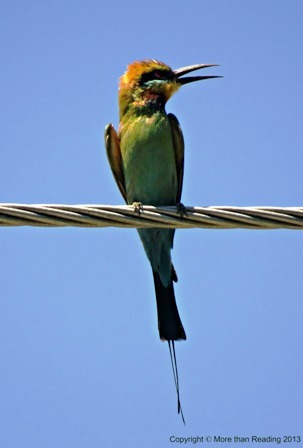 Two more birds, just like this one, visit on nearby wires, but don’t stay long. and now, a head scratch. I whisper to my friend. I shout to that intruder over there! Any help in recognising this bird happily accepted! And one more thing…. why does it have two feathers? strands? below the main tail? I live in the U.S. Guess that is why I have never seen one. You obviously did better on the net than I did. Found out the name ‘with a little help from my friends’… but had not heard of it before. So ‘tail shafts’ are the two things below the tail? Interesting. Thanks again. Thanks Liz… helpful as always. Glad some things don’t change! I had seen them around and thought they were beautiful – love the colours… but did not know the name. Matchstick birds is new to me too. In Mary’s comment, above, she called the end feathers ‘tail shafts’. what state or country do you live in. 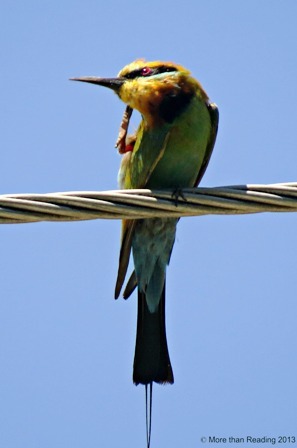 That may help in identifying what kind of bird this is. I have never seen anything like it flying around here! Thanks Mary – that information may help! I am in the tropics in Queensland, Australia.